When I found this recipe, I honestly couldn’t believe it. It was telling me that prep time was only 15 minutes and cook time was only 1 hour. Lasagnas I have made in the past certainly took well over 2 hours. I don’t mind it at all, but why spend an extra hour cooking when you can make it just as tasty in about an hour. Always looking to try something new, I decided to put it to the test. Kudos to the people at Kraft for coming up with this recipe (which I’m sure was meant to appeal to busy soccer moms, but hey it appeals to busy multi-tasking, 20-somethings like me who crave for home-cooked goodness without slaving in the kitchen too). Shortcuts are definitely appreciated on certain days. I hadn’t had a home cooked meal in about a week. I had been living off salads for lunch and then turkey and swiss sandwiches with a side of soup for dinner. YUM right? After the third or fourth day, not so much. I still had to do laundry, start on applications and read some journal articles for lab. 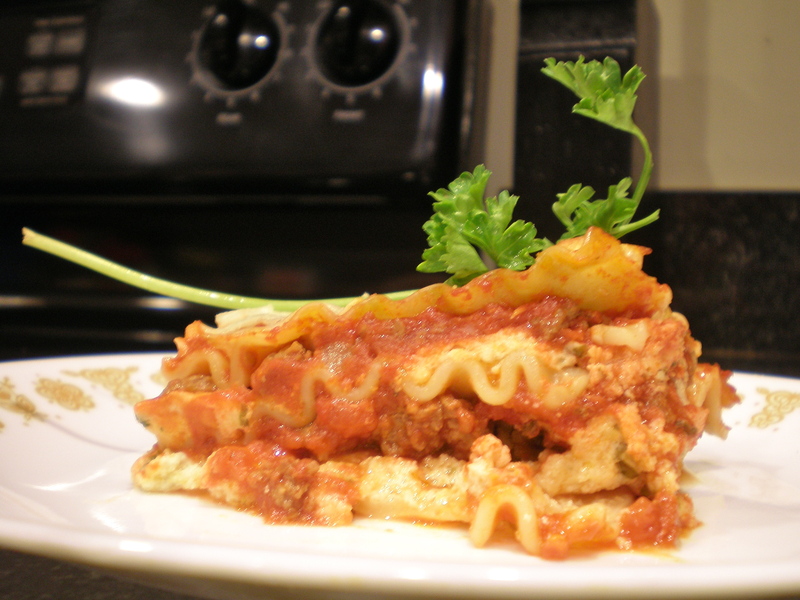 At the moment, lasagna seemed impossible yet this recipe made it happen. Better yet – the noodles didn’t need to be pre-cooked. That’s right! I said it!! You get to throw them in there raw. This bit right here is what sold the recipe. Step 1: Preheat oven to 350°F. Brown the meat in a skillet on high heat. While the meat is cooking, grab a bowl and mix the egg and ricotta cheese, 1/4 cup parmesan and parsley until well blended. Set aside. When the ground beef is cooked, drain the oil from the skillet. Lower the heat down to medium-low. Add the spaghetti sauce into the skillet then add a cup of water into the empty jar. Seal the jar and give it a good shake. Add the water to the sauce and mix until evenly combined. 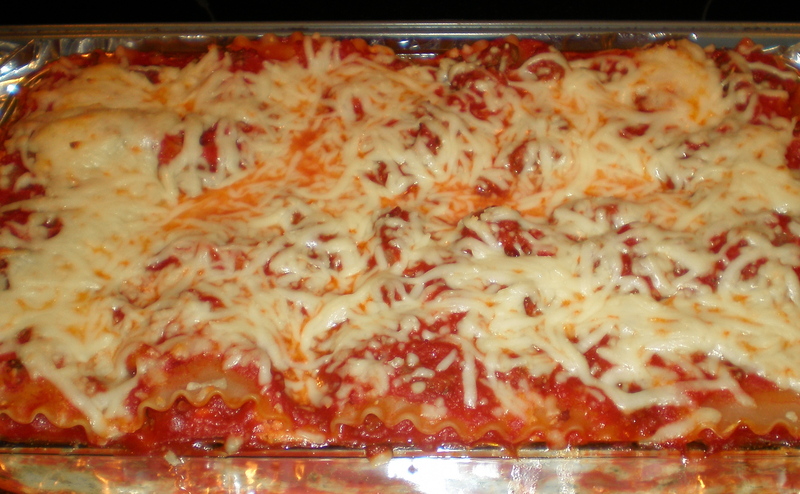 Step 2: Assemble the layers of goodness: Spread about 3/4 cup of the spaghetti sauce onto bottom of 13×9-inch baking dish; cover with layers of 3 noodles, half of the ricotta mixture and 1/2 cup of the mozzarella cheese. Repeat layers. Top with remaining noodles and sauce. Sprinkle with remaining mozzarella cheese and Parmesan cheese. Cover with foil. Step 3: Bake 45 min. Remove foil. Bake an additional 15 min. or until noodles are tender and lasagna is heated through. Let stand 10 min. before cutting to serve. In case you’d like to go veggie, substitute the ground beef with chopped spinach and mushroom. Mmmm. It’s so easy it makes my heart melt..and they’ll never know much work you didn’t do. YAY! i will be looking at your blog from time to time. the lasagna looks delicious! my mom always uses spinach in her lasagna! it tastes good no doubt, but i LOVE her non veggie one much better. — so she substitutes the ground beef for ground turkey for healthiness. Yes!! I loveeee spinach in my lasagna. Miss you xtine! !